“To modernize the Chinese people, it has to start from the modernization of the genre ‘novel’.” Liang Qichao, the famous Chinese intellectual in the early twentieth century, envisioned a collapsing China to be salvaged by, first, its modernized literature. Indeed, throughout China’s long century of struggle, exploration, and transformation, literature has been playing a crucial role in negotiating (the consequence of) modernity, fueling revolution, investigating human interiority, constructing national identity, and coping with trauma and diaspora. This course introduces students to the masterpieces in modern Chinese literature and their representations of critical events in twentieth-century Chinese history. In this course, we will focus on the genre “novel” and pay close attention to the language and literary devices that the authors use for storytelling, characterization, and self-representation. The class is organized by themes, such as, for example, modernity, revolution, diaspora, root-seeking, trauma, science fiction and so on. Through class discussions, writing assignments, and oral presentation on the final project, this course will further develop students’ language proficiency, especially reading ability and effective communication in a formal setting. 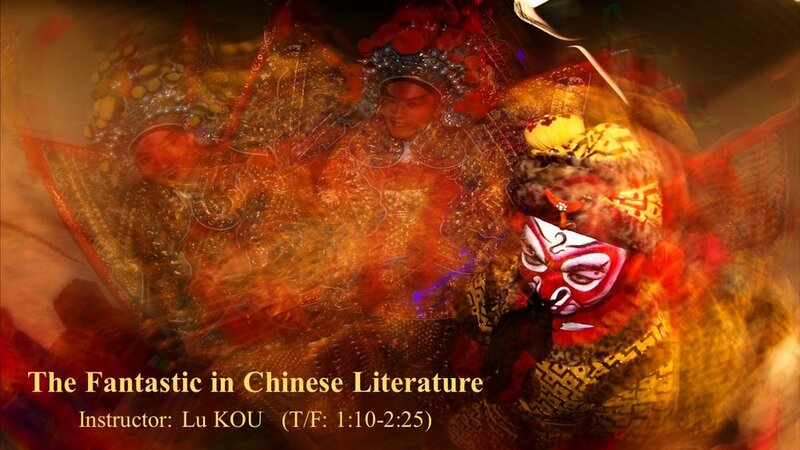 This course also trains students to be a critical reader who will be able to not only analyze the key moments and literary masterworks of modern China but also reflect on the complexity of Chinese culture vis-à-vis its tradition and the global context. The course is conducted in Mandarin. "Xiuci 修辭, Leituo leike 雷妥類克, and Rhetoric: Establishing the Discipline of Rhetoric (Xiuci xue 修辭學) in Early Twentieth-Century China"
"The Fantastic in Chinese Literature"
From the famous human/butterfly metamorphosis in the Daoist text Zhuangzi to contemporary writer Liu Cixin’s award-winning Three-Body Problem, the “fantastic” has always been part of Chinese literature that pushes the boundary of human imagination. Readers and writers create fantastic beasts (though not always know where to find them), pass down incredible tales, assign meanings to unexplainable phenomena, and reject–sometimes embrace–stories that could potentially subvert their established framework of knowledge. Meanwhile, the “fantastic” is also historically and culturally contingent. What one considers “fantastic” reveals as much about the things gazed upon as about the perceiving subject–his or her values, judgment, anxiety, identity, and cultural burden. Using “fantastic” literature as a critical lens, this course takes a thematic approach to the masterpieces of Chinese literature from the first millennium BCE up until twenty-first century China. We will read texts ranging from Buddhist miracle tales to the avant-garde novel about cannibalism, from medieval ghost stories to the creation of communist superheroes during the Cultural Revolution. The topics that we will explore include shifting human/non-human boundaries, representations of the foreign land (also the “underworld”), the aestheticization of female ghosts, utopia and dystopia, and the fantastic as social criticism and national allegory. All materials and discussions are in English. "War of Words: Diplomacy and Rhetoric in Early Medieval China"
"Improvising Poetry in China's Medieval Court"